Democratic Governor Sentenced to 7 Years... Blames Rove! Democratic Governor Sentenced to 7 Years… Blames Rove! 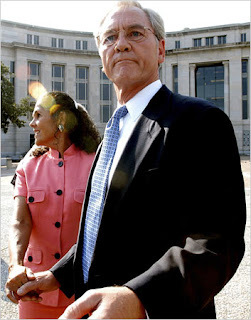 Former Democratic Governor Don Siegelman was sentenced to 7 years in Federal Prison today. Today Siegelman said he was a victim of the evil genius Karl Rove(? )– but the court saw it differently than Siegelman and his apologists at The New York Times and sentenced him to 7 years in Federal Prison. He was taken into custody immediately. The AP does not even mention that Siegelman is a democrat! Former Alabama Gov. Don Siegelman was sentenced to more than seven years in federal prison and former HealthSouth CEO Richard Scrushy got nearly seven years Thursday in a bribery and corruption case that the judge said damaged public trust in state government. Supporters of both men testified at their sentencing hearing, listing their good deeds as attorneys pleaded with U.S. District Judge Mark Fuller to show mercy. “While it is true the good far exceeds the bad, I must impose a fair punishment to reassure all that come before this court that justice is blind,” Fuller said in sentencing Siegelman. Scrushy was fined $150,000 due immediately, plus ordered to pay restitution of $267,000 to be paid to United Way of Central Alabama. He also was ordered to perform 500 hours of community service when released. NBC15 forgets to mention Siegelman’s party affiliation, too. This is another MSM report that ties into Don Surber’s “Name That Pary” game.